We have the best range of professionally designed steel, aluminium and timber plans available. 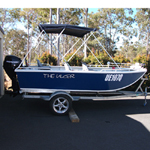 Sport, dive, fishing or cruising designs for recreational or commercial use ranging in length from 4 metres to 18 metres. We have just introduced our range of custom designs, available as plans or CNC kits. We will be expanding the range over time, so check back regularly. 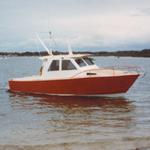 Please note that we no longer offer technical support for the range of Boden Sailing vessels not shown on this site. 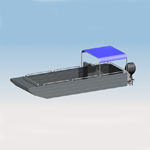 Building a Boden Boat Plans design will reward you with the personal satisfaction of having completed a worthwhile project, give you pride in the ownership of an excellent seaworthy design, and provide years of boating pleasure. Please make some time to check out our new designs and read what others have asked in the MEMBERS QUESTIONS section for each design. Ask a question by using the CONTACT US facility. We also now have "featured products" which appear in our SPECIALS section. Each month we will select 3 different designs which we think our customers will be interested and then offer them at a special price!